Many years ago, when dinosaurs walked the earth, I was a college student, undecided about everything in life except what music I liked, which was, as it is now, blues, jazz, and soul. A friend of mine introduced me to Bobby Womack, via his MCA recording, So Many Rivers, and I will forever be grateful to him. The combination of Womack's gritty vocals and his songwriting, which related more to everyday life than most music I listened to at the time, was a potent one. Needless to say, I was hooked, and still am today. Since then I've been able to listen to a lot of Womack's great earlier and subsequent work, but recently I stumbled onto a retrospective of Womack's tenure with MCA, Only Survivor: The MCA Years. The collection, which was released several years ago, takes in songs from Bobby's three solo MCA albums (So Many Rivers, Womagic, and The Last Soul Man) as well as a few songs from his vocal appearances on the Crusaders' MCA albums and with Crusader sax man Wilton Felder, all recorded between 1980 and 1987. The highlights are many, including his collaborations with the Crusaders ("Inherit The Wind" and the chill bump-inducing "(No Matter How High I Get) I'll Still Be Lookin' Up To You," with Alltrinna Grayson), but my favorites are from his first two solo efforts. "I Wish He Didn't Trust Me So Much," about Bobby trying to resist the urge to make a play for his best friend's wife, oozes with tension and longing. The same could be said for his cover of Jerry L. Williams' (better known as Swamp Dogg) "Wanna Make Love To You." Other memorable tracks include "When The Weekend Comes," Womack's cover of his friend Sam Cooke's "That's Where It's At," and the title cut, in which Bobby laments the passing of so many of his colleagues over time. 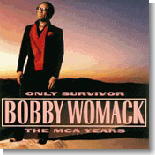 Since his tenure with MCA, Womack has recorded sporadically. He has leaned more toward the modern urban sounds, mixing rap and hip hop into his recordings but never straying far from his soul roots, even releasing a wonderful gospel CD in 1999. This collection is a fine introduction to one of the last of the great soul men, but by no means is it the whole picture.